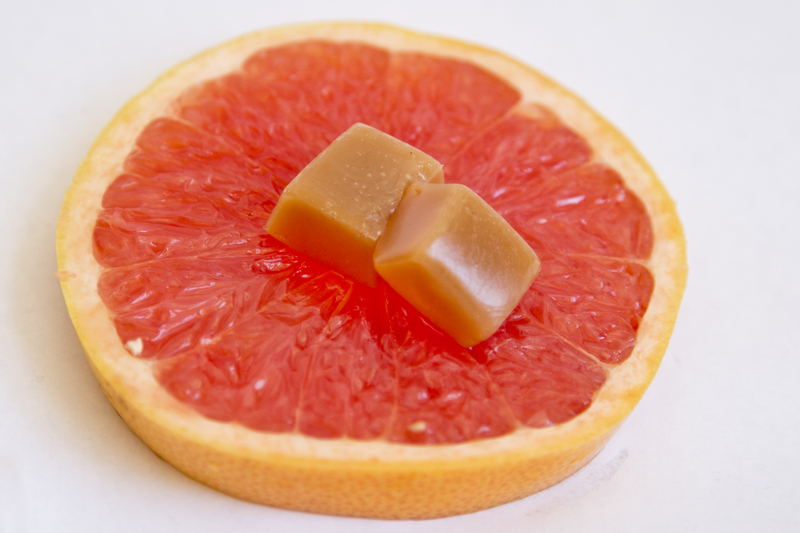 When I told people, that I was making grapefruit caramels for this week’s blog post the reaction was the same: gross. 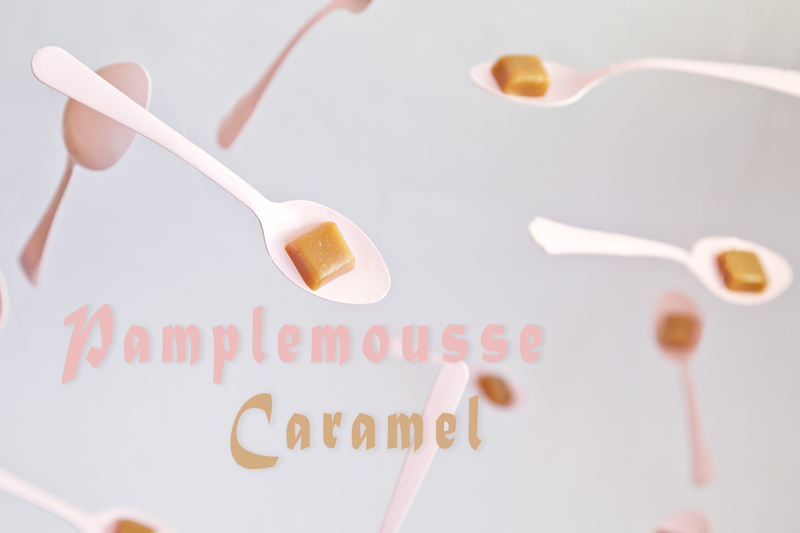 I’m not really sure why, but the combo of caramel and ruby-red didn’t sit well with people, so I pulled a classic re-branding tactic and gave the caramels a french name, pamplemousse caramel, which translates to … grapefruit caramels. 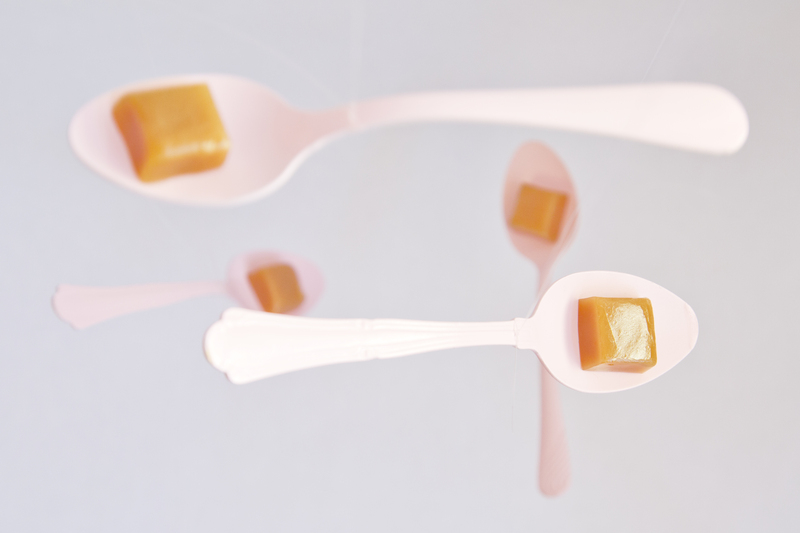 People now thought the caramels sounded lovely and elegant and insisted I save some samples for them. There are many desserts that we view as gourmet because of their french namesake. If we renamed them with their english equivalents people would probably be less impressed. For example, creme brûlée which is a staple of the fancy eating translates to burnt cream. I can tell you if I saw burnt cream on a menu I would be hesitant to order it. Petits fours translates to small oven because they were traditionally made in small ovens, which is interesting, but it is definitely less classy to order a small ovens, rather that petits fours. My (french) husband loves these cookies called langues-de-chat. Pretty name, which translates to cat tongues. Less pretty in anglais Whether they are called grapefruit or pamplemousse caramels, they are delicious. I was worried about making them because I had never made caramel before having to get the exact correct temperature seemed a bit more complex than my laissez-faire cooking style could handle. 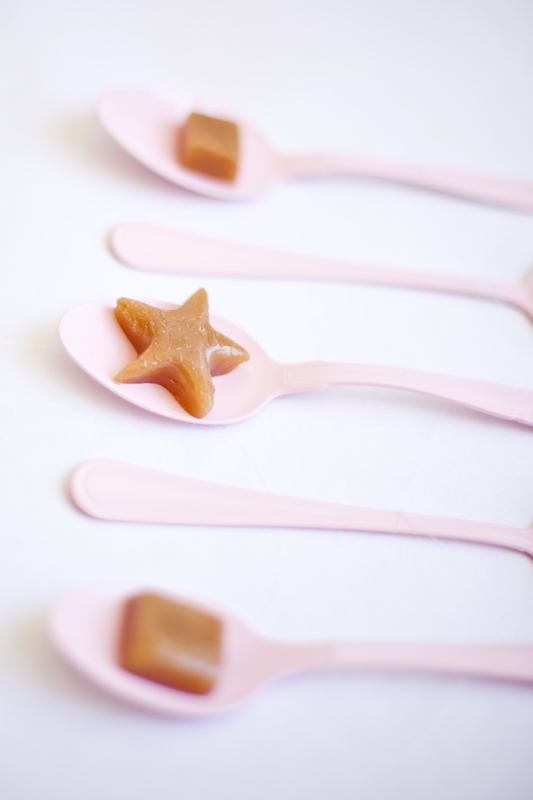 But I prevailed and the caramels turned out really well. 3 teaspoons grapefruit zest-If you don’t like grapefruit you can use any citrus zest. 1. Line an 8 or 9 inch square baking pan with parchment paper. Lightly grease paper. 2. In a saucepan, heat butter, cream, and salt; bring to a boil. Stir in grapefruit peel. 3. In a heavy bottomed saucepan, mix sugar, corn syrup, and water. Heat to boiling over medium-high heat. Do not stir. Boil until a candy thermometer reads 310◦F (sugar will be a golden amber color). 4. Add cream mixture and whisk until thermometer reads 248◦F. Pour into pan; cool completely. Cut into squares. People often ask me about my studio. I think they envision a slick, brightly lit location, with lots of props, windows, and photography equipment. Sadly my ‘studio’ is my very small living room, which does have nice light, but little else. I often have to come up with creative ways to create different looks with almost no budget. That keeps it interesting though. 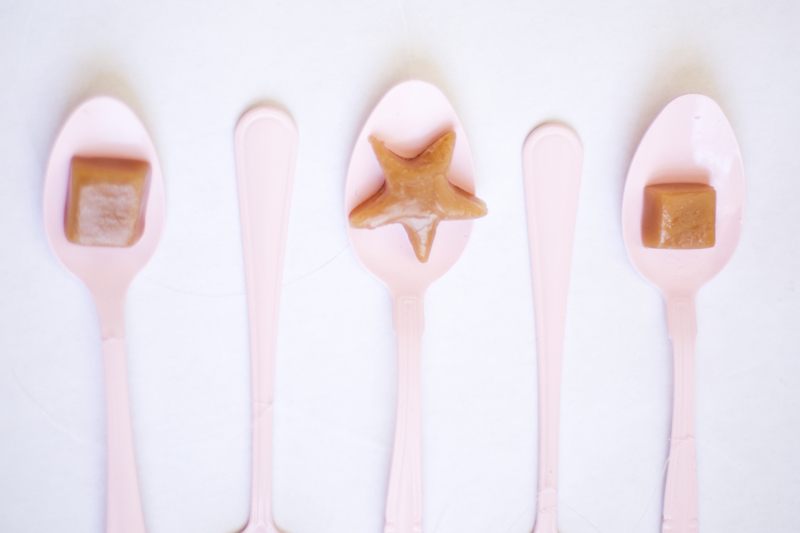 This week I bought $2 worth of thrift store spoons, painted them pink with $3 spray paint and hung them from fishing line. Voilà! 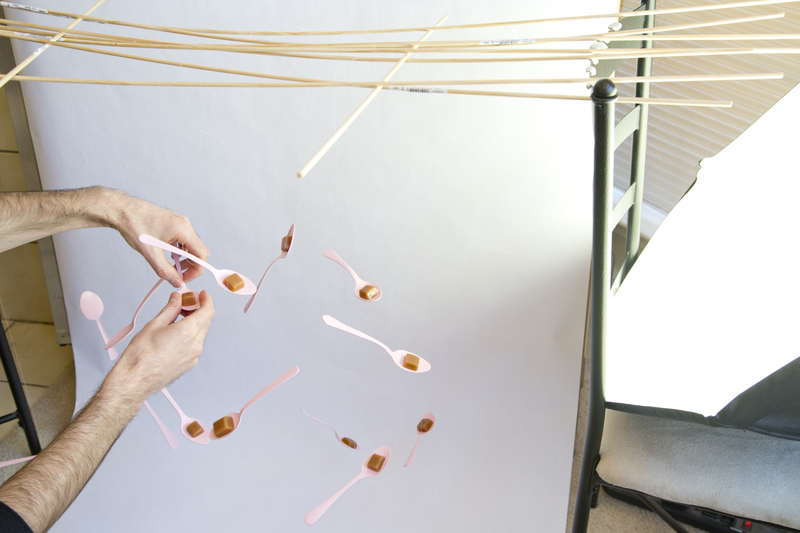 Flying spoons for the bargain price of $5. 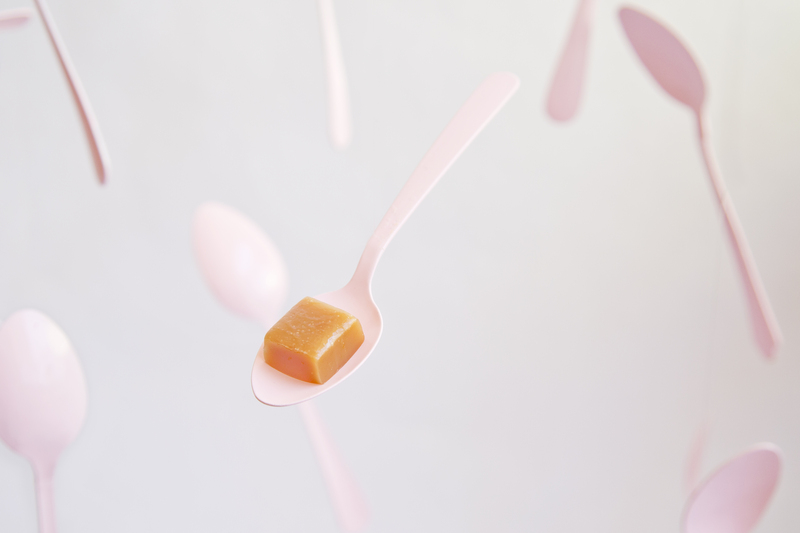 Categories: Recipe | Tags: caramel, dessert, food blog, french desserts, grapefruit, grapefruit caramel, North Alabama, Pamplemousse, recipe, thejealouscrumpet, Violet Henri | Permalink. Sylvia, Thank-you!!! I occasionally work for a magazine that has a huge budget for props and they had lots of fun, colorful cutlery, but it was 40 or 50 dollars a place setting. So I just spray painted my own. 😉 I wouldn’t eat with them, but they look pretty. I have plates that I bought for a dollar that I do the same things with. 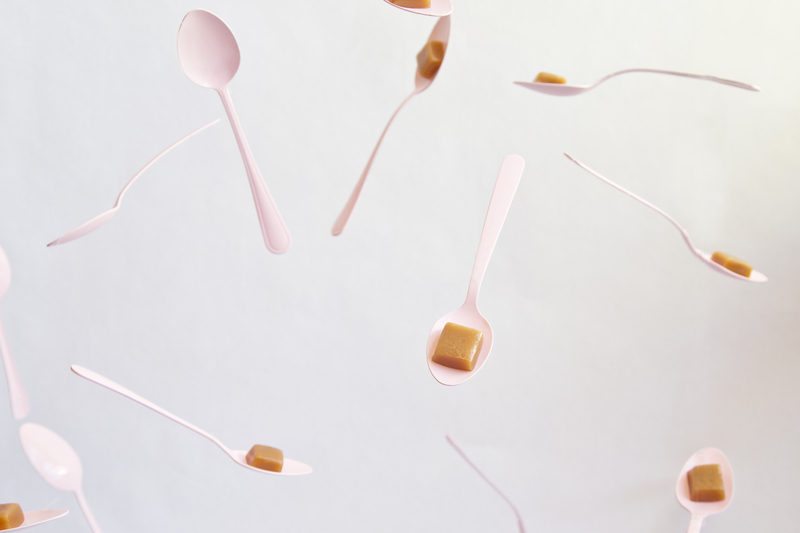 I can’t wait to see your colorful spoons. Thank-you!!! You have a nice day as well.